Can you imagine being the Hulk and trying to do normal stuff that we all do? Try grocery shopping when you're twenty feet tall and as wide as a semi truck. It's not easy! Have a hankerin' for some fast food? Try fitting beneath that clearance bar in the drive-thru... not gonna happen! And thus is the sad life of Hulk. 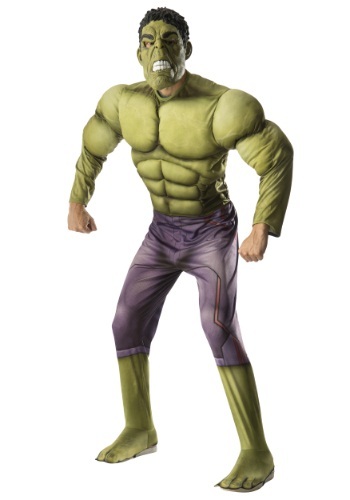 Luckily, this Deluxe Hulk Costume from Avengers Age of Ultron won't make you humongous, but WILL make you look just like the gamma radiating good guy. All the fun, none of the mess... so no accidentally destroying your friend's house at the costume party. Unless, like us, you forget to put the car in park again and somehow drive thru the garage door... whoops!